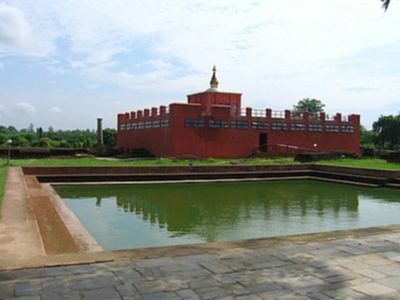 Lumbini  is the sacred site of the birth of Sakyamuni Buddha. It is located in southern Nepal, near the Indian border. Bhairahawa - is the nearest airport to get Lumbini if you want to fly from Kathmandu. The closest station is at Nautanwa, India on the Indian Railway network, but passenger trains are infrequent on this line. The alternative of taxi travel from the border crossing at Sunauli to Gorakhpur takes about two hours. 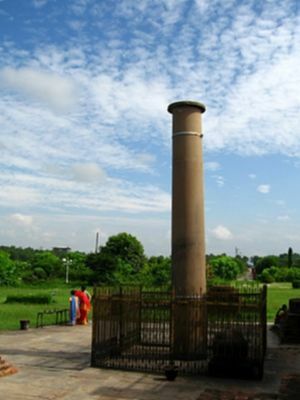 From Sunauli, Siddharthanagar is only 3.5 kilometers. Total travel time is 12 – 18 hours from Dehli and 10 – 12 hours from Kolkata (Calcutta). The Mahaparinirvan Express tourist train stops in Gorakhpur where tourists continue to Lumbini by road. Buses ply the route between Sunauli (from stop across from Hotel Yeti) and Lumbini. At Lumbini alight at the main gate. Alternatively, from the Nepal side of the border one can take a shared jeep to Bhairahawa (4 kilometers) followed by a bus to Lumbini. Bhairahawa-Lumbini buses depart every 15 minutes. The last return bus departs at 5 PM. Taxis are probably the best option for reaching Lumbini from Sunauli, though you will need to know the going rate to avoid paying well over the odds. As everywhere else in the sub-continent, ensure that the fare has been agreed before heading out. This will save trouble at the destination. Given that the sights in Lumbini are far across, bicycles and cycle rickshaws offer a good way to get around. Bicycles can be rented at hotels in Lumbini (100 NRs/day), as well as the Korean monastery (provided you are staying there). Bicycles are also available near the main gate next to the cycle rickshaw stand. Make sure of the condition of the tires, as a flat will mean pushing it back over miles. Also check the condition of the seat and the lock. The Golden Temple of Myanmar Oldest structure and beautiful work on temple building. Hire a bike- you can barter for any bike for 50 rupees- and bike around the temples. There are a few 'no bike' zones- the best way to get to the majority of temples is to come out of the main tourist road and turn right onto the main road then left through the first main gate to the park. There is the possibility of your tyres being let down- we were approached by a young boy asking for money, claiming he was hungry then pointing us to his friend selling lotus. We declined but returning to our bikes later, found out tyres had been purposely let down. As we'd had no run-ins with anyone else and no real problems with the bike shop, we can only presume it was the boy. There are a couple of dhabas near the bus stop in the village. They all serve the same fare: puri in the morning, "curry" during the day, at 20 NRs a portion. Right at the beginning of the of the one street that is Lumbini village there is a rooftop restaurant 3 Foxes. Close to the bus stop you'll find the 365 Restaurant. A red bulding. Nice cheap restaurant with friendly staff, they serve good asian and western food. Momos Veg with Chilly just 120 Rupees. New Cottage Lodge (M. Prabin Goswami), Siddharthanagar, Belahiya 1 (Sunuli) Nepal (200 m away from Sonauli border), ☎ 071_521968. editcheap lodge suitable for bag packer. Lumbini Garden Lodge (300-800 NRs) +977-71-580146 Situated in the main bazaar, east to the Main gate at just about 1 minute walk. The Mayadevi Temple is just 10 minute walk from this hotel, so the location is very good. The rooms at Lumbini Garden Lodge are clean and well maintained. They have big and nice rooms with attached bath and shared bath as well. Windows have mosquito nets too. They also WIFI connectivity which is fast. It is peaceful to sit in the Balcony and get the view of Lumbini Bazaar. Korean Monastery: sleep in a dorm for 300 NRs, including 3 meals a day; No smoking (outside the gates it is allowed), no music, dancing, card games, etc. Sri-Lankan Pilgrims' Rest House, about a 15 to 20 minute walk from main site. The Holy Birth, about a 5 minute walk from Maya Devi temple, behind Yeti Bank. Gautam Buddha Lodge (200-400 NRs) is situated in A nearby village. The owners are rude and the rooms seem to be infested with mosquitoes, spiders and cockroaches. Far from the main entrance. Pawan International Hotel, Main Road, Siddtha Nagar, Tel:+977 71 523-680. Hotel NirvanaPaklihawa rd, Siddtha Nagar, tel: +977 71 520-837, 520-516, . Hotel Glasgow pvt ltdBank Road, Siddtha Nagar, tel: +977 71 521-737, 523-737. Sunflower Travellers Lodge Buddhanagar Lumbini Nepal, tel: +977 71 580-004. Sunflower Travellers Lodge has A/C and non-A/C rooms. Its ran by very polite and helpful Chinese staff and the rooms are cleaned very frequently. They have laundry service, Wi-fi, message, and vehicle booking. The lodge's Chinese food is great and also has a western kitchen and wide selection of western deserts. Buddha Maya Gardens Hotel, (near Lumbini gardens), tel:+977 71 580-220. Tourist Busses to Pokhara are for 700 Rupees available. You can buy them directly at the Bus stop or in your hotel. There is one Tourist Bus to Kathmandu, with A.C for 1200 Rupee. This page was last edited on 30 September 2017, at 12:30.